In May 2014, Art Garner published his book Black Noon, (39) devoted to the 1964 Indy 500. Some important facts that may have played a part in the tragedy have been pointed out by Garner and I feel it's necessary to point these out. This neither necessarily means I agree with every single point that Garner raises nor that I disagree with every argument Garner uses to absolve Dave MacDonald from any part blame or responsibility. Garner brought forward lots of evidence that Dave MacDonald only had limited practice time in the days before and after qualifying. The reason ahead of qualifying was the revamp of his car as carried out under the responsibility of Peter Bryant. After qualifying the team lacked an engine to go in his car. 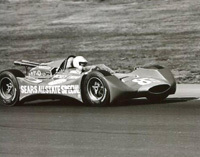 The Ford engines available to the team were destined for the other two cars Ford wanted to have in the field. Because of the accidents with those two cars the team lost much time with repairs as well. Garner judged much of the information found on the Internet as “providing a lot of speculation and “what if” scenarios.” (39, p.4) By mentioning the contents of his publication in an appendix while not including the majority of them in the original pages (only two have been used in the original series of articles) and by not discussing them in the way that I did with information coming from other sources I hope I won't have turned the contents of his publication into more examples of such “speculation and 'what if' scenarios”. 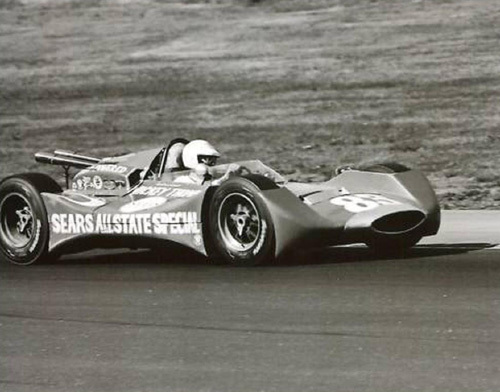 Exactly half a century ago the Indianapolis 500 lived through its most horrific overture, a fiery multi-car accident that stopped the race and claimed the lives of Dave MacDonald and Eddie Sachs. The cause of the accident was never established, and so for years, all sorts of theories and myths were allowed to run wild. Some, such as the infamous 100-gallons myth, continued to fester for such a prolongued time that they eventually transformed into the accepted truth. Commemorating the tragic events of May 1964, Art Garner’s Black Noon was published just ahead of the 50-year anniversary and is the first book to fully deal with the horror blaze, the lead-up to it, its aftermath and all the issues surrounding the drama. Garner talked to many of the survivors, and dug into a vast archive of books, magazines and newspaper clippings. It’s hard to find anything – or anyone – he missed, apart from perhaps Jack Brabham. As a book, it’s a great read that will have you page-turning right towards the end, as the weight of the inevitable tragedy presses ever harder on the reader’s shoulders. The best part is undoubtedly the book’s lengthy middle section, which gives a day-by-day account of the Month of May leading up to Race Day, Garner presenting every bit of detail while reserving judgement on it. His journalistic approach is definitely the best way to present all the facts and opinions, but for the reader, it’s heartache all the way. Often with books like these, though, it’s a question of balance. On the cover, Black Noon is advertised with a quote from Bobby Unser, who says he would ‘recommend it for everyone, from the racing historian to the casual sports fan.’ We absolutely agree that the casual sports fan will have his money’s worth, but the motorsports aficionado might at times feel inclined to quickly leaf through the pages introducing all the bit players – he knows all that, and Garner’s writing isn’t always gripping enough to make these pages worthwile all the same. Conversely, the racing historian might feel a bit short-changed with the length devoted to the aftermath of the tragedy. Maybe that’s because Garner seems very much convinced by his own theory that MacDonald got caught by the wind when he was forced to go underneath both Hurtubise and Hansgen. It’s plausible indeed, since the Thompson did suffer from lift quite a bit, but we will never be sure. Here, it’s actually a pity that Black Noon was created for a wider audience, abstaining from scholarly notes. Apart from the drivers’ quotes, we will have to guess on which sources Garner based his theory. There is no footage that will prove the scenario beyond doubt, and the analogy with an earlier ‘three-wide’ practice shunt isn’t all that clear-cut – that didn’t happen exiting one of the turns but at higher speeds, on one of the straights. It’s also a shame that Garner dismisses research done on the Internet as a ‘great deal of speculation and “what if” scenarios’, whilst also ignoring every type of Internet source in his impressive bibliography. It’s a stark and pretty willful dismissal, since much of the ‘speculation’ on forums such as TrackForum and the Autosport.com Nostalgia Forum is serious work done by serious enthusiasts. Perhaps he did so because he wanted to be acknowledged as the first to present a radical new theory. And if that is so, you can see why. For instance, enthusiasts on the Nostalgia Forum had already disproved the 100-gallons myth convincingly in 2007, using many of the same sources Garner used. It was this discussion that moved 8W’s Henri Greuter to compile his four-part series on the 1964 inferno, another example of serious research that just happens to be published on the Internet. Let’s say that Garner was the first to debunk the 100-gallons myth by means of a book. It’s in stark contrast to another book commemorating an Indy anniversary, Beast by Jade Gurss, which tells the story of the one-off Mercedes engine that took the Indy world by surprise in 1994. In this, Gurss acknowledges and praises work done on the Internet, not just because he is a gentleman, but also since he knew that his book would add so much to what had already been done. Since Garner has every reason to be similarly proud, there was no real need to degrade the work of others in the same field. Even though there are probably more question marks left than Garner in his closing chapter is leading us to believe, his biggest achievement is that Black Noon finally makes short work of the supposition that a young, brash, inexperienced driver caused the accident by wanting to win the race in the opening laps. Dave MacDonald’s legacy was long tainted by this injustice, and it’s heartwarming to see Garner finally lift the curtain of doubt over one of the great lost talents of the sport.